Home / Uncategorized / Is it REALLY Garbage? Next post: What does it take to prepare for a show? Just learned a bit more on these ‘less’ attractive woolz. That was a very interesting and informative read. All wool has its usefulness with a bit of extra tlc. I only am able to spin these type of fleeces. I have never even seen a great fleece in the raw. We help a farmer on his shearing day and he pays us with some of his fleece. Now know that these are meat sheep raised for slaughter and the farmer does not care what condition the fleece is in. Many are crossed breed with hair sheep, have very short fiber and they are loaded with vm and are filthy. My friend and I use what we have and do end up with some great results. Thank you for writing this……I appreciate this article and wanted you to know that you have lifted my spirit since I get down sometimes thinking about how much work is involved but then ralley when the fleece is finished knowing that this sheep will live on not only for it’s meat. I love this article! I’m a Dirty Fleece Girl and I’m proud of it. I take meat sheep fleeces farmers want to composte and I work through them. I also purchase some fleece, will go for the vm covered stuff because it’s more affordable. I don’t have the funds to buy pristine fleece. Also I derive great pleasure from spinning straw into gold. Also, much of what might not get spun from combing or carding waste will become stuffing for pillows or crocheted toys and things. Wasting any wool makes me sad. Renae – Thanks for your comment. Pristine fleeces really are expensive. They may be lovely to spin, but all that cleanliness comes at a (legitimate) cost, not only to us as handspinners, but to the shepherds. And the hit on their bottom lines – financial as well as day to day lives – is not insignificant. And I’m so glad you use everything you can! Isn’t that one of the things that makes what we do so rewarding? Spinning straw into gold is joyous, it’s fulfilling and it’s an adventure! Keep spinning all the woolz! I love this article. I have been amazed at spinners who comment about trashing a fleece. I learned from the wool that was on the back end of the sheep. It was nasty but that’s what I had so I spun it. As a teenager I couldn’t afford much so took what was given to me and spun lots of undesirable wool. So spend some time and give that fleece a chance! These fleeces are what we call “Free Puppies”! tempting to accept, but a world of trouble! They may be more work, but I wouldn’t call them trouble. Lack of time is a legitimate concern and a half pick up load is a lot of wool. You need to be able to look at your fleece reasonably and honestly – do you keep the whole load or pick out a few pounds next time may be a better question to ask. Especially as bat guano really is such good compost….. This post is about giving what is normally considered “unspinnable” a solid look and consideration. And to remind us – as many people have commented here – that not everyone is privileged enough to have pristine wool and yet they make amazing garments. They should not feel bad for having only flawed fleeces and flawed fleeces should not be disregarded so easily. Indeed, I admire them and their yarn for creating wonderful things. I often admire them more for literally (in some case, sense 1) turning straw into gold! Hm. Not sure if I offended you, but it wasn’t meant that way. More along the lines of, “I looked and said it was not spinnable, but now you’re going to make me look twice and I may NEVER be able to throw any wool away again!”. Knowing that even lousy wool is salvageable makes my life harder when it comes time to cut back. 🙂 I’ll survive, though. We have become rather spoilt when it comes to having ready-to-spin and low-prep materials available, no argument. It is awesome to know that even some of the stuff that doesn’t fall in those categories is useful and can be brilliant given the opportunity. You took 507 burrs out of 2 lbs of felted wool…? Main reaction from me is HOW….not sure you could have even seen the wool, just taken it on faith that there was some in there somewhere….! Wow. That’s dedication! Not at all – I mostly didn’t want you to feel you *MUST* use such fleece. I do want spinners to look twice – but I think you already did that if it was coated in guano and all felty and rained on on the outside! I don’t ever want to revisit The Great Bur Debacle of 2013. Just know it’s doable. LOL! Thanks for that tip! That tip changed my life. It came AFTER the Great Bur Debacle. When I give workshops on fiber prep/wool characteristics, I always try to have a “less than perfect” fleece on hand (Allison, you’ve seen me go directly toward the worst fleece in the batch specifically for this purpose). It is so much easier to show people exactly what to look for and what to avoid when you have examples on hand. I’ve noticed that most of the time, folks are pleasantly surprised at just what you can do with a “trash” fleece and how nice the fiber can be after a little bit of work. Awesome article, thanks for sharing. I love Abby, her classes are always a wonder. I had never quite thought about it this way, though I’m not sure why. It makes total sense, as does most of Abby’s teaching. Thanks again! This is a great post. Thank you! I have worked with many a questionable fleece in many years I have been spinning. 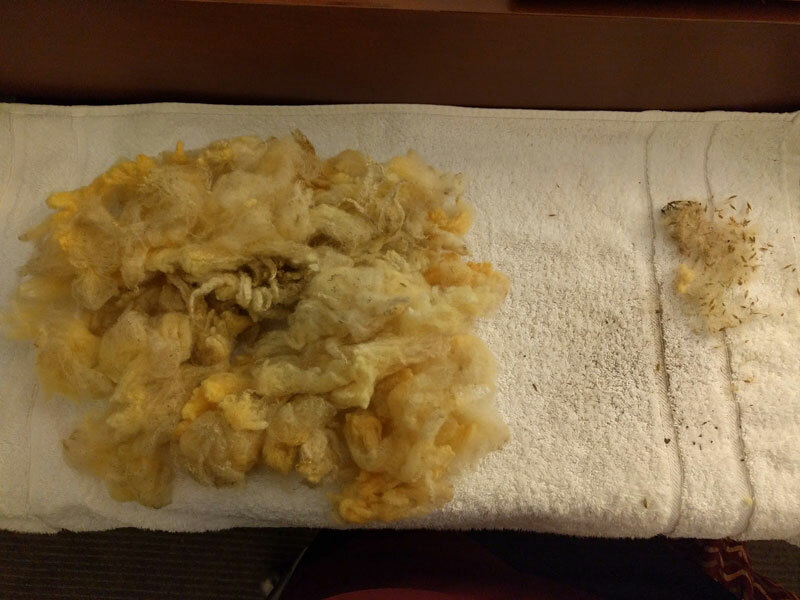 I simply dont have the funds to devote to ready to spin fiber, and having my own sheep has been an adventure in frustration to try to get really good clean fleeces each year. Some years I am more successful than others. But, I love most of them. Thank you for shepherding! We couldn’t do this without you. I’d love to hear you share more about how much work it is to keep fleece clean as a shepherd. So much is involved. That could be an entire series of blog posts. When I started, I had no idea what it took to get clean fleeces at shearing time. It was trial and error. 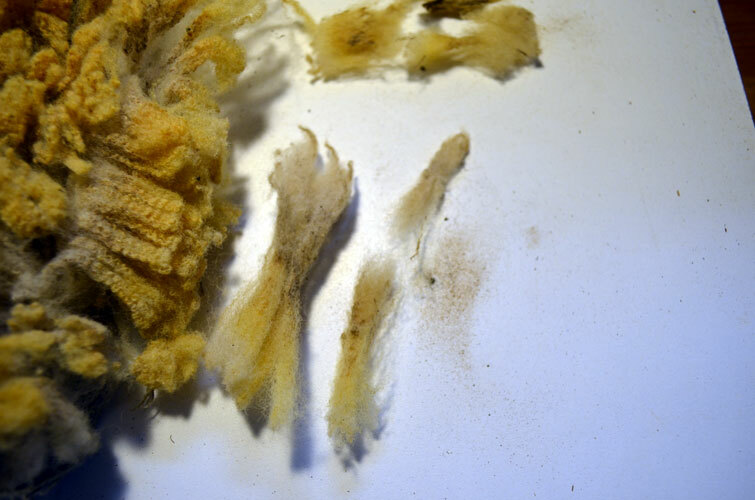 So much goes into those pristine fleeces on a daily basis, and one wrong move can ruin an entire years careful work. The shephard must think of everything from the design of the feeders to how many animals can fit comfortably in a given space in the dead of winter. Hay must stay down low in feeders. Feeder space cannot be overcrowded or sheep will push each other and felt damp fleece in winter. They also have an irritating habit of putting their head into the hay feeder, grabbing a big mouthful of hay, then pulling their head out and looking around, thereby dribbling said hay all over the backs of each neighbor in turn. Gah! I learned years ago that round feeders in open spaces help solve this problem because they stand like spokes in a wheel instead of shoulder to shoulder. Overcrowding is a big issue for all shephards. The barn lot never looks overcrowded until the muddy time of year when it’s too late to ship or transport animals because of the weather. And it’s always a balancing act between the normal year and the one that was the wettest on record when all the animals seem to be slogging through the barnyard even though you were sure you had it right this time. And that’s only a couple of the many considerations that a good Shephard has to think about not just every year, but daily. I once saw some of the most beautiful alpaca fleeces ruined in a single weekend by a “helper” who fed for the Shephard while she was gone. Instead of putting the hay in feeders as instructed, he threw the hay over the fence, and over the animals backs. Then it rained on them before she realised what had happened. Wet alfalfa is nasty to get out of a fleece. She had worked so hard. It was very frustrating. The fleeces were still nice, but not pristine as they certainly would have been. And she took the hit financially for the mistake, too. You don’t ask pristine prices for fleece with alfalfa stained and stuck in there. Well, that’s enough. Sorry for running on. I just feel for shephards. It’s a job, and I only keep a few crossbred ewes. Ha ha, I just realized I’m Jen and Jennifer in the comments. Oops. Thank you for this great post, Alison, and to Cat for keeping great notes and taking great photos. I love the jacketed fleeces I buy, but I also take the time to look through the less-than-perfect fleeces. A lot of my very favorite fleeces have been from sheep who didn’t know I would want to spin them, and got into everything. The note on burrs in great – I learned that one the hard way, too. It would be great to hear more from shepherds about how hard it is to keep fleeces clean, with or without jackets. It’s good to be reminded about the hard work you put in on our behalf. Thanks Meg – I am adding this request to my blog post list because I totally agree with you! The dirt and veg doesn’t bother me as much as second cuts. Is there any thing to do with them? The fleece I am stumped with has them all though the wool. Every thing was just picked up and bundled together. You’re right this really is awesome!! Since we couldn’t even give away our professionally sheared fleeces l decided l’d have to learn to spin myself. As l had no carders l decided to start with our older, amateur – shorn fleeces (different lengths and dirty) and when l have plied the yarn will use it in place of garden twine. l hope by the time l get to the better fleeces l will have improved so l can knit my yarn. Thank you for letting me know l do not need to card it first! You don’t need to card before scouring. But I would recommend a good shake out, and if they’re really dirty, a cold soak or two before scouring. Then shaking them out again before you card them once they are dry. Carding will tend to pulverize VM and you want to try to shake out as much as possible. You also have the option of opening up the fiber with your fingers and spinning from the cloud and not carding at all! So many options. Good luck with your new adventure. I’m not sure who you tried to give it away to, but there are regional pools, local fiber festivals that often take it into fleece sales if the fleeces meet requirements, and you may also contact me about your flock, do you have a specific breed or are they mixed? If they’re breed specific and the fleece is in good condition, I may be interested.